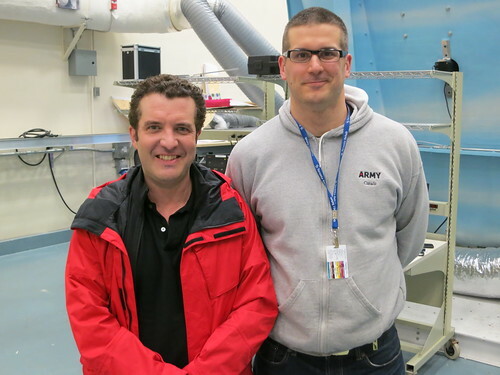 As one of the top 25 papers published in Applied Ergonomics in 2012, we were invited to create an “audio slide” presentation to supplement our paper entitled “Evaluation of the Kinect(TM) sensor for 3-D kinematic measurement in the workplace“. Recording a person’s posture and movement (motion capture) is important for much of our work. The conventional method for motion capture are difficult to use in real-world applications because of their complexity (6-8 cameras placed around the subject). This is why we were so excited when the Microsoft Kinect sensor was released. 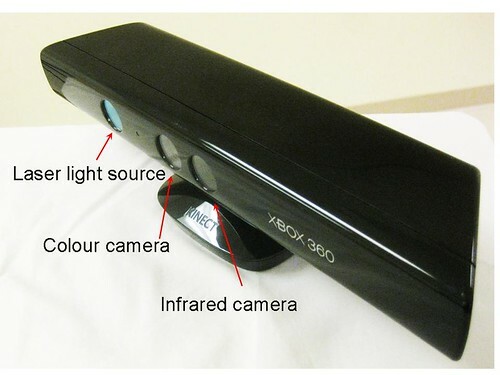 The Kinect add-on for the Xbox 360 has the ability to capture 3D information from a single sensor that costs ~$150. In contrast, a conventional motion capture system cost ~ $100,000. The Kinect was designed to let users play games without a handheld controller. Instead, the sensor recognizes the user’s gestures and voice commands. The key is the device’s “depth camera” made up of an infrared laser projector and an infrared video camera mounted within the sensor. The Kinect creates 3-D maps of the space 1m to 3m in front of the sensor. The technology was developed by PrimeSense. Hector Martin (a hacker) developed and released drivers to the public that allowed the Kinect to be controlled by a personal computer within days of Microsoft’s release in November 2010. These reverse engineered drivers allowed programmers around the world to start experimenting with the Kinect to determine its capabilities. Within weeks, a flurry of new applications emerged in a variety of fields including robotics, virtual reality and machine vision. Some even referred to the Kinect as “…a revolution in the making” . A few programmers released software packages aimed at getting even novice users involved [2, 3]. These packages incorporated calibration techniques taken from the OpenCV library for aligning colour and depth images as well as conversions for scaling acquired depth maps to metric units making 3-D reconstruction possible . At first Microsoft warned they would seek legal action to prevent the use of Martin’s open source drivers  but later changed their tone . A representative for Microsoft stated that the Kinect’s USB connection was intentionally left unprotected to allow developers access to the Kinect’s hardware and that Microsoft supported such tinkering [7, 8]. Microsoft later announced that they would be releasing their own software development kit to allow programmers to design software for Widows 7 PCs . The Kinect may be a leap forward in 3-D motion capture technology. If the Kinect sensor has comparable accuracy of existing lab-based systems, it will provide a compact, portable motion capture system allowing motion capture to be done in the field simply and inexpensively. Our first careful investigation of the device was a comparison of the Kinect with a gold standard Vicon motion capture system. This work was published in Applied Ergonomics in 2012 and can be found here. Webb J. The Kinect revolution. New Scientist. 2010. 208(2789):5. Burrus, N., Kinect RGB Demo v0.4.0. 2011 [updated February 28, 2011; cited March 1, 2011]. Available from: http://nicolas.burrus.name/index.php/Research/KinectRgbDemoV4. Kreylos, O., Kinect Hacking [homepage on the Internet]. Davis, California: Oliver Kreylos; 2010 [updated December 2, 2010; cited February 14, 2011]. Available from: http://idav.ucdavis.edu/~okreylos/ResDev/Kinect/index.html. Bradski, G., OpenCV. 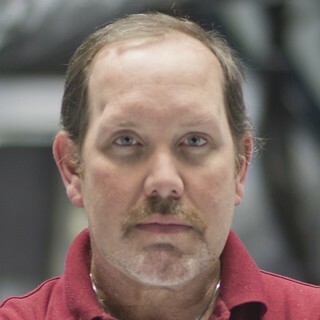 Menlo Park, California: Gary Bradski; 2010 [updated February 11, 2011; cited February 22, 2011]. Available from: http://opencv.willowgarage.com/wiki/. Giles J. Inside the race to hack the Kinect. The New Scientist 2010. 208(2789):22-23. Hudson, A., Kelly, S., Microsoft Kinect ‘hack’ opens up possibilities. 2010. Available from: http://news.bbc.co.uk/2/hi/programmes/click_online/9210071.stm. Wortham, J., With Kinect controller, hackers take liberties. 2010 [updated November 21, 2010; cited February 14, 2011]. Available from: http://www.nytimes.com/2010/11/22/technology/22hack.html?_r=1. Wingfeild, N., Microsoft Moves to Aid Kinect Hackers. 2011 [updated February 24, 2011; cited February 24, 2011]. Available from: http://blogs.wsj.com/digits/2011/02/21/microsoft-moves-to-aid-kinect-hackers/. I think this could work on a TRI coffee mug or t-shirt. First, Yoda is great example of someone who’s aged successfully. He uses an assistive device. He is wise and powerful. 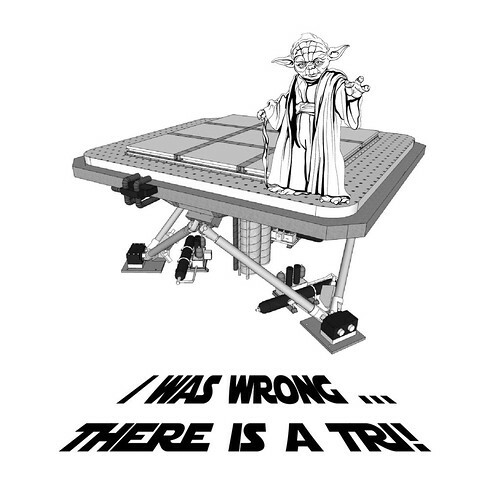 Also, I think Yoda was wrong to devalue the act of trying. Trying matters. We may fail or succeed but what matters is that we try to solve the problems we see around us. When we do fail, we learn from the failure and try again. 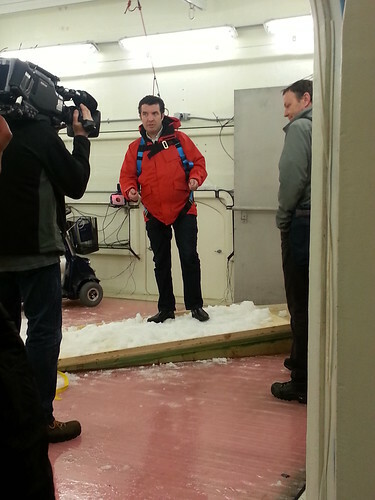 The Rick Mercer Report visited Toronto Rehab today. Rick took a scooter for a ride outside in the slush, walked up a snowy ramp, fell down some stairs in StairLab and steered a driving simulator. 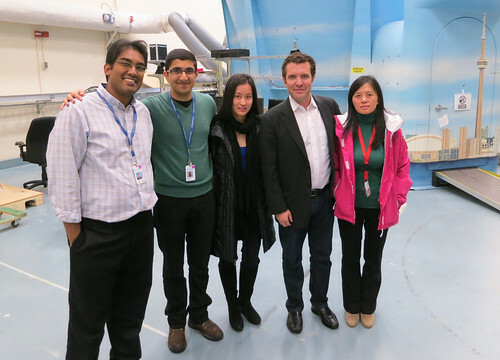 Here are some photos of his visit. The following video shows Rick learning about the capabilities of StairLab. Tim is a volunteer at Toronto Rehab and has helped out our team by doing tours of the lab for visitors for a number of years. He also happens to have been a patient here at Toronto Rehab. Tim shares his experience in the videos below recorded on February 14th, 2012 at the Allied Health Research Day. This is a talk Geoff gave at a conference on health care policy in Ottawa in 2011. Geoff speaks at 28:20 and answers a question at 59:15. Unfortunately, the camera stays on Geoff rather than cutting to his slides, but if you’ve seen his other talk, you can imagine what he’s describing. Geoff Fernie presents some of our team’s work at the Canadian Associating on Gerontology conference on Aging in a Changing World held in Oct 2012 at Simon Fraser University.